Big Walnut Local Schools Superintendent Angie Pollock talks to residents about the district’s ballot issue that voters will consider on Nov. 7. Pollock spoke Friday during the Sunbury/Big Walnut Area Chamber of Commerce’s candidates’ breakfast at NorthStar Golf Club in Sunbury. 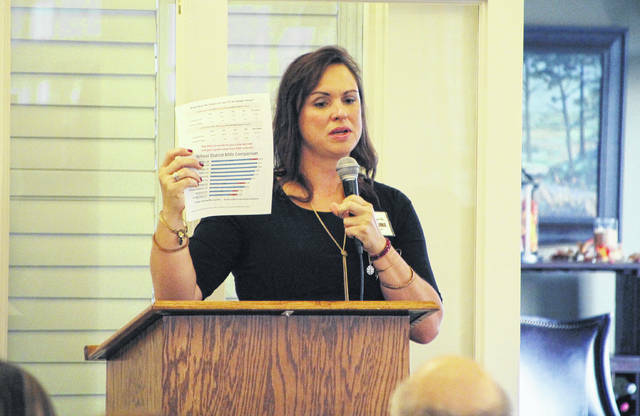 Growth and development was discussed by most of the candidates and speakers at the Sunbury/Big Walnut Area Chamber of Commerce’s candidates’ breakfast at NorthStar Golf Club in Sunbury on Friday. “We have so much going on,” said Delaware County Commissioner Jeff Benton, mentioning “four major long-term growth plans.” One of those plans involved facilities, which included acquiring the Delaware Area Career Center’s north campus. Benton said the economic development plan was focused on “shovel-ready sites,” with infrastructure and low-cost sewer lines in place. Transportation was also mentioned, with two freeway interchanges, the “point” of routes 36/37 in Delaware, and east-west corridors considered the top priorities. Candidates for the eastern part of Delaware County’s council, school board, and trustee races were given the chance to say why they should get the public’s vote. Berkshire Township incumbent trustees Mike Dattilo and Rod Myers were not present; nor were the candidates for Porter and Trenton townships; nor was Galena council candidate Bob Molter. Council hopeful Kathy Krupa said that although her family has only lived in the village a few years, she has “an absolute love of Galena.” She wants to balance upcoming development with preservation. Incumbent David Simmons said, “We have successfully kept a small-town flavor and we want to continue to do so” by holding events in the village and celebrating holidays as a community. Genoa Township incumbent trustee Karl Gebhardt said the majority of residents are satisfied with how things are handled in the township, and that “we’re under budget and debt-free.” He opposed the county’s takeover of the EMS system, and he wanted to provide housing for people at different stages of their lives. Connie Goodman, who replaced Rick Carfagna as a trustee, said managing the budget, keeping safety services the residents want, and balanced development were the major challenges for Genoa going forward. Renee Vaughan said her family moved from Pittsburgh to Genoa Township and loves its rural feel. She said as a member of a home owners’ association, she was one of many who opposed a potential CVS at Big Walnut Road and State Route 3, and she decided to get into politics after one trustee still voted in favor of the store. Lifelong resident Dave Jackson pointed to his accomplishments as a five-term trustee, among them upgrading the fire department. “We’ve lived within our means,” Jackson said. Bob Singer, a 35-year resident, pointed to his business experience and action items “to move us to the next level,” such as a newsletter, master plan, and surveying the residents. Two of the three Kingston Township trustee candidates spoke; incumbent Bill Shively did not. Challenger Jim Fedako, whose experience includes being on the Olentangy School Board, pointed to recent audits that had two findings for recovery. Incumbent Steve Volpe attributed the financial issues to “Obamacare,” and said he’d work with the Ohio Department of Transportation on traffic issues and build a simple new township hall without raising taxes. Scott Weatherby spoke of growing up in Sunbury, and as a council member, is now improving the village’s park system. School Board Vice President Brad Schneider was last to speak, thanking all who were on the ballot. Big Walnut Superintendent Angie Pollock spoke to the audience about the district’s ballot issue that voters will consider during the Nov. 7 election. District officials handed out information sheets about the issue, which includes a 6.6-mills, 37-year bond and a 1.25-mills permanent improvement levy.